We’re often told that an event or offer is a “˜once-in-a-lifetime’ opportunity, something not to be missed; and usually that’s just hyperbole. 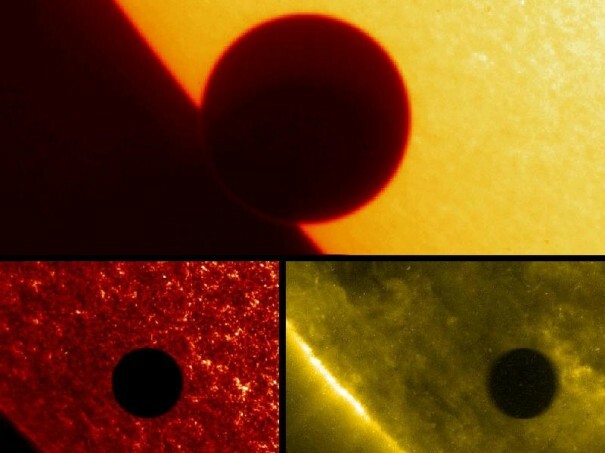 But on June 6 we’ll witness an astronomical event that is truly a once-in-a-lifetime occurrence: the transit of Venus. When one astronomical body moves in front of another, astronomers call it a “˜transit’. In our Solar System, the inner planets Mercury and Venus can come between the Earth and the Sun and produce a transit. When this happens we see a tiny black dot appear to crawl across the Sun’s face, as the planet moves along in its orbit. For this to happen, the planet has to pass directly between Earth and our Sun. But given that the planets orbit at slightly different angles, they mostly pass above or below the Sun as seen from Earth. Transits of Mercury are not too common, but transits of Venus are incredibly rare. They come in pairs eight years apart — the most recent was in 2004. But between the pairs there is a huge gap of either 105.5 or 121.5 years. This means there wasn’t one during the whole of the 20th century and after this year, there won’t be another until 2117! That’s why it is worth making the effort to experience the June 6 event — unless you discover the fountain of youth, you will never get the chance to witness another one. These days, transits are considered mostly to be a curiosity, albeit a spectacular one. But in centuries past they had much more significance as they played a leading role in determining the size of the Solar System. Astronomers had worked out the relative difference in the sizes of the orbits of the planets, but they had no way of working out the actual distances. In 1716 Edmond Halley (after whom the famous comet was named) worked out that transits of Venus could be used to calculate the distances from Earth to both Venus and the Sun. This could be done by triangulating observations made from widely spaced places on Earth. For Australians the most famous of those observations was made in 1769 by Captain James Cook during his first voyage to the South Pacific. Viewing the transit was the main task of his journey. And of course, on the way home, he just happened to bump into a certain wide, brown land we now call home. This year’s transit will occur on the morning of June 6, with the whole event lasting about six-and-a-half hours (see the table). With the exception of Perth and the far west, who’ll miss the beginning, all of Australia and most of New Zealand will witness the event, weather permitting. Because Venus will be moving across the face of the Sun, we must use the same precautions as would be needed to witness a solar eclipse. Simply put, do not look directly at the Sun or Venus, with or without optical aid. Do not try to use homemade filters, welder’s goggles and so on. It’s just not worth the risk of damaging your eyesight or being blinded. There are two safe ways to experience the transit. The first is to view it via the internet. Sydney Observatory (www.sydneyobservatory.com.au) and others will broadcast the event via webcam. Venus has taught us so much about life on planet Earth — it even helped Captain Cook land on Australia. 1639 Englishmen Jeremiah Horrocks and William Crabtree become the first to witness a Venus transit, after Horrocks correctly predicted the event. 1761 Observations were made worldwide from as far apart as Siberia and Madagascar. Results included the prediction that Venus has an atmosphere. 1769 Worldwide efforts to witness the transit include Cook’s voyage to Tahiti. On the way home he landed on Australia’s east coast. 1874 More than 100 years since Captain Cook’s voyage, observers in Australia and other southern locales were in the right place to witness this transit. 1882 Interest in transits had waned considerably, as other methods were now available to measure the distance to the Sun. 2004 The “˜most seen’ transit as millions of people worldwide witnessed the event via webcams over the Internet.